Best cocktail of probiotics including four strains of Lactobacilli to prevent inflammation, promote tolerance and restore hormonal balance Discover all the benefits of our new formulation! Endo-Optimize Probiotics new formula is now available for purchase online. At the leading edge of innovation, we, at Braverman Reproductive Immunology, have a constant interest in discovering new therapy or ingredient able to significantly improve your reproductive health. To this end, we have updated our Endo-Optimize Probiotics formula, with a new strain of probiotics Lactobacillus acidophilus complex. Taken once a day, our new formula now contains 4 strains for a total of 40 billion live culture per serving. In addition, our vegetarian capsules (DR caps) are acid resistant and designed to release our probiotics after an extended period to prevent their degradation by the stomach acidity allowing optimal delivery. The intestinal tract is inhabited by bacteria forming the gut microbiota. An imbalance in the gut microbiota can alter the immune system leading to inflammation as seen by the rapid expansion of Th17 cells (1). Probiotics are live microorganisms that when orally ingested in adequate amounts, confer a health benefit by modulating the gut flora and stimulating the local immune system. They may induce an immunomodulation of Th1, Th2, regulatory T cell, and Th17 cell production (2). Many scientific studies have shown that probiotics selectively target the Th17 lineage in the prevention and management of inflammatory and autoimmune diseases (3). Indeed, Lactobacillus Gasseri strain has been shown to suppress Th17 pro-inflammatory response in a mouse model of allergic asthma (4). Lactobacillus Plantarum represses the expression of pro-inflammatory cytokines including IL-1β, IL-6, TNF-α and IFN-γ in a mice model of colitis (5) and arthritis (6) in addition to repressing NF-[Symbol]B, a master regulator of inflammation. Lactobacillus Reuteri significantly reduces the production of pro-inflammatory cytokines in mice including IL-1α, TNF, and IL-6 levels (7). Our latest addition to the formula, Lactobacillus acidophilus is also able to suppress IL-17 and TNFα production as seen in a mice model of colitis (8). Further, it decreases factors responsible of IL-17 induction such as IL-23 and TGF-β that induce and maintain the Th17 lineage (9) as well as STAT-3, transcription factor mediating the establishment of Th17 cells (10). You may understand that our cocktail of probiotics represses inflammation and IL17 production at multiple levels reducing Th17 cells differentiation (by reducing IL-1β), Th17 cells expansion, stabilization, and/or conditioning (by reducing IL23 and TGFβ) which lead to the decrease of several pro-inflammatory cytokines including IFNγ (11) for full anti-inflammatory cell effects. In addition, the down-regulation of Th17 cells production by probiotics has also been associated with the up-regulation of anti-inflammatory cytokines such as IL-10 (12), which are key actor in the maintenance of the immune balance. Pregnancy establishment and maintenance require the acquisition of maternal immune tolerance towards the paternal alloantigens present on the fetus. Regulatory T cells play a key role in inducing this immune tolerance preventing the fetus from being attacked by the maternal immune system. Probiotics can help induce immune tolerance thus allowing the survival of the fetus during pregnancy. Lactobacillus Reuteri can promote regulatory T cell development and function in patients affected by inflammatory bowel disease (13). L. Acidophillus can also increase the number of Treg cells and suppress the progression dermatitis as seen in a mice model of this disease (14) and in vitro studies using human blood cells (15). L. Gasseri was shown to significantly increase the proportion of Treg cells in the blood of children suffering from allergies after ingestion of the probiotic for 3 months (16). Many autoimmune diseases or other conditions such as PCOS or endometriosis may lead to systemic inflammation and oxidative stress. Oxidative stress with the production of ROS (reactive oxygen species) has been shown to severely damage the mitochondrial function thus leading to poor oocyte and embryo quality and may be involved in infertility and recurrent pregnancy loss (RPL). Lactobacillus Acidophilus has scavenging properties (anti-oxidant potential) reducing the production of hydrogen peroxide in vitro in a human colon cell line (17). Similarly, L. Reuteri significantly increases antioxidant activity (18). L.Plantarum has strong reducing capacities, lipid peroxidation inhibition properties, as well as many free radical scavenging actions (19). In high-fat fed mice, L. Plantarum was shown to have similar effects on lipid profile with a strong attenuation of the hyperlipidemic status in addition to decreasing lipid peroxidation (24). Similar observations were made in a same animal model when L. Acidophilus was given (25). preventing the development of glucose intolerance, dyslipidemia and oxidative stress associated with diabetes (27). Lactobacillus Plantarum may prevent the development of insulin resistance, at least in part, by preventing obesity (28). Lactobacillus Reuteri may protect against insulin resistance by preventing the suppression of PPARγ and GLUT4 (two factors involved in the use of glucose by the adipose tissue) in response to a high fructose diet (29). reducing biomarkers of inflammation (CRP) and oxidative stress (plasma nitric oxide). Another randomized study led in pregnant women with GDM (gestational diabetes) supplemented with a cocktail of probiotics including L. acidophilus, L. plantarum and L. Gasseri showedsignificant beneficial impact on these women’s lipid profiles, anti-oxidant status and blood pressure (31). One of the principal regulators of circulating estrogens is the gut microbiome. The estrobolome is a collection of gut bacteria able to metabolize estrogen by producing beta-glucuronidase. 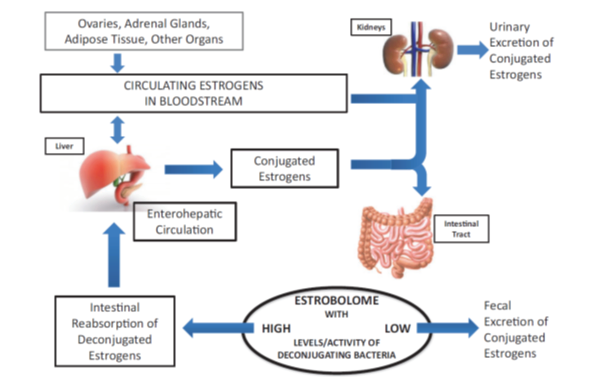 As seen in the figure below, if the estrobolome is enriched in glucuronidase enzyme, estrogens will be deconjugated into their active form which allows their reabsorption by the intestine leading to increased free estrogen levels in the bloodstream (32) and this puts you at greater risk for the development of hormone driven disease such as endometriosis. Figure 1: Estrobolome and entero-hepatic circulation of estrogens Women with endometriosis have been shown to have lower lactobacilli concentration (33). Further, higher levels of glycosidase have been found in the peritoneal fluid of infertile women with ENDO vs infertile ENDO-free patients (34) Lactobacilli and particularly L. Acidophilus (35) and L. Plantarum (36) can inhibit the β glucuronidase activity which lead to lower levels of free estrogen. Pioneers in the field of Reproductive Immunology, we are taking the greatest care to select our ingredients based on scientific evidences showing beneficial effects on women fertility. The Endo-Optimize Probiotics supplement is the result of our work and has been developed to be the best solution to counteract inflammation, minimize oxidative stress, promote immune tolerance, improve your lipid profile and insulin sensitivity and restore hormonal balance.